It isn’t only creative people who should attend creative training. Sir Ken Robinson, arguably the world’s leading speaker on creativity in education has long understood the crucial importance of creative training. As he once said, ‘my contention is that creativity is as important in education as literacy, and we should treat it with the same status’. But he’s not alone in grasping the seismic shift that needs to take place in the economies of the West. In his book, ‘A Whole New Mind’ , Daniel H Pink asks two questions that any savvy person should ask themselves about their job. One, can someone overseas do it cheaper? And two, can a computer do it faster? The fact is that the future wealth of Great Britain and other Western economies (and that of their corporations and businesses) will depend on the ability to do things that cannot be done cheaper elsewhere, or faster by a computer. In a nutshell, that means using creative, original thinking. Apple computers may be manufactured in China, because production costs are lower. But all the thinking that makes them so desirable takes place in California. Thus, much of the wealth that the company generates – and all of the profit – remains in California. The same is true of Dyson, many of whose imaginative products are now produced in Asia. The intellectual copyright, wealth and profits of the company reside in Great Britain. It’s all too easy to poo-poo the value of creative training. You may question its cost, and perhaps even begrudge staff the day or days away from the office that will inevitably be involved. But consider this: in today’s business environment, competitors are becoming more innovative and, as a result, more disruptive. Your most threatening competitor may very likely be a small startup that you haven’t even heard of yet. Which means that if your company is to continue to prosper your team must embrace new ideas, new methods and new ways of working. They can no longer shelter behind timeworn processes. The inner creativity of workers must be teased out and encouraged. I hope the booklet and web pages I wrote will help turn the trickle of workers from non-creative industries that attend D&AD courses into a torrent. I am convinced, if the West is to continue to thrive, creativity must take its rightful place alongside logic and literacy in the workplace. 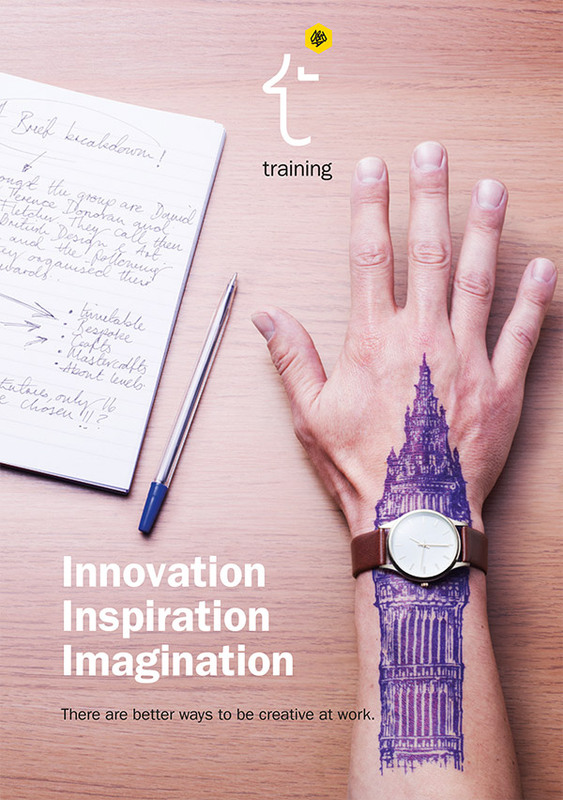 Click here to find out more about D&AD Creative training. Or call Sarah Jupp, Senior Manager of Professional Development, on +44 (0) 20 7840 1130. I must say that it was great fun working with her and the rest of the team at D&AD, in particular, Tim Lindsay, Dara Lynch, Mathew Parker and Denise West. They must have enjoyed it too. They’ve just hired me to do another project. Why I chose posters for my Desert Island ads.